The club’s hub repeater is VE7RNH operating at 146.760 (-600). The repeater is located on Granite Peak in the Fly Hills, South-West of the City of Salmon Arm, at an elevation of 1724 meters above sea level and 1370 meters above the surrounding area. The repeater has IRLP access when the link is up to VE7RKA on Greenstone Mountain near Kamloops. In turn, VE7RKA is at times linked to the Northern Repeater Network which extends to north of Prince George, west to the Queen Charlotte Islands and east into northern Alberta. 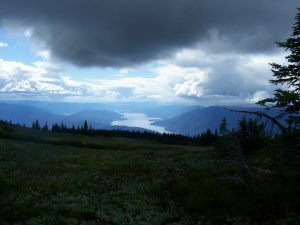 On September 9, 2008, the club established its second repeater, the VA7AHR machine at 147.140 (+600) on Adams Hill, at the extreme western end of Shuswap Lake. This repeater is linked to VE7RNH. This gives the club greatly improved coverage into the Western Shuswap areas. Looking west from the Queest Mountain repeater site. In the summer of 2010, the club established a repeater, VE7QMR, on Queest Mountain north of Sicamous. Its frequency is 145.470 (-600). This repeater will give better service to the eastern end of the Shuswap Area, including the Anstey Arm of Shuswap Lake and the Eagle Valley east of Sicamous. The photo shows a view from the site looking towards the Blind Bay/Copper Island area. The three Shuswap Amateur Radio Club repeaters are normally connected together via UHF links and a UHF hub repeater on Granite Peak in the Fly Hills area. The Greenstone Mountain repeater, VE7RKA, operated by the Kamloops Amateur Radio Club is also normally connected to the network.